Tucked away in the sand dunes, Saye Beach Campsite is the place for camping in Alderney in the Channel Islands & one of the best holiday locations in the UK. Recently refurbished to a very high standard with new bathroom block, dry room facility and a play area for children, the Saye Beach campsite offers a well-stocked shop, picnic area, teas & coffees, ice creams and beach goods as well as the perfect location to pitch your tent! Tents are available for hire, or you can bring your own. Situated in a superb location behind the sand dunes of the unrivalled Saye Bay, just two minutes from the exciting surf of Corblets Bay and the family-friendly crescent of Arch Bay. Pronounced ‘Soy’ by locals, Saye is a lovely long beach of white sand right next to the campsite. The sea is beautifully clear and blue, there is rockpooling on the rocks at each end and more than enough sand for anybody that cares to sit there! Even in the height of the summer you can often discover an entire beach all to yourself, or share it with a couple of oyster catchers or the resident grey seal. 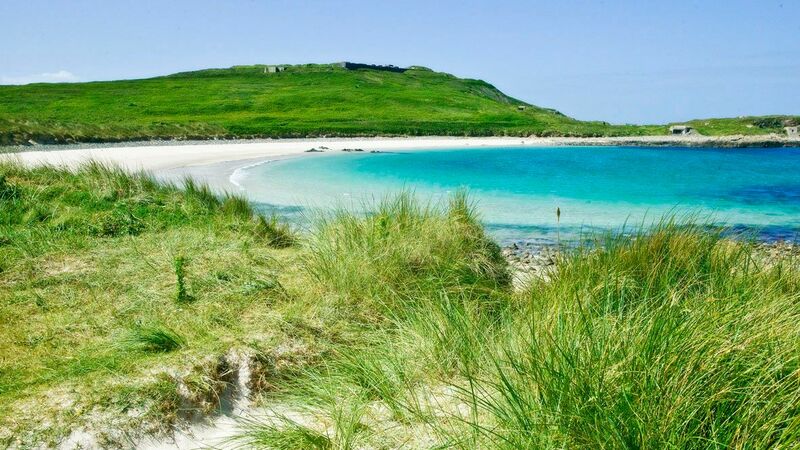 The beach dunes protect the campsite perfectly, with a gentle tumble over the soft sands down to the sea. A gentle 10 minute walk from Quesnard Lighthouse and just 15 minutes from the picturesque 9-hole Alderney Golf Course, it offers all the facilities for the perfect camping holiday. Copyright Saye Beach Camping 2019©. All Rights Reserved.